NOTE: You need the WooCommerce Discount Rules PRO to add this discount to your online store. Buy 1 quantity and get the second quantity free. Let us guide you step by step for all these scenarios. The configuration is quite simple. You can specific a rule title, a description and the validity dates. If you leave the validity fields empty, the rules would apply with immediate effect. Choose whether the discount applies to All Products in the store, or for just specific categories. All Products : Choose this option if you want to apply the discount store wide for all products. IMPORTANT: Make sure to check the box that allows counting the quantities cumulatively. Specific Categories: Choose this option if you want to apply the discount only for selected categories. In the conditions tab, you can also choose to exclude selected products from this discount rule. User Roles: You can limit this discount rule for a particular user role. Example: Wholesale customers. Coupons: You can also activate this rule when a customer applies a coupon. Refer this article on how to activate a discount rule using a coupon code. This is the most important area where you set the discount conditions for the rule. So please read the instructions carefully. As discussed at the beginning of this tutorial, there could be different discount scenarios. In all these scenarios, the store owner wants to provide 1 product free, when a customer purchases any 1 product in the store. No store owner would prefer to give a $1000 item free when customer just purchases a $100 item. NOTE: When customer has only 3 quantities in the cart, only 1 cheapest among them would be given as free. Only if his quantity goes to 4, he would get 2 items free. 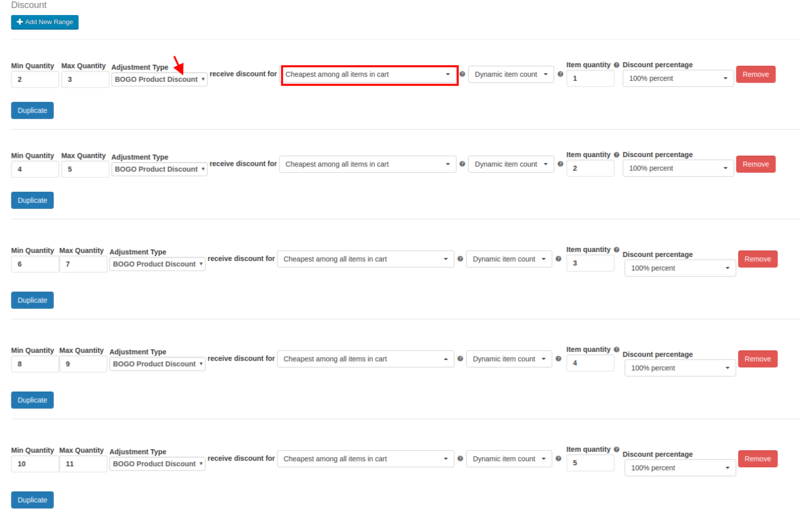 Notice the Item count and Item quantity fields. The Item count increases as the customer gets eligible for more cheapest items when his purchase quantity increases. Example: When a customer purchases 4 quantities, he is eligible to get 2 cheapest among them free. See an example discount below. Customer purchases 4 items each with 1 quantity. He is now eligible to get 2 of the cheapest items in the cart as free. 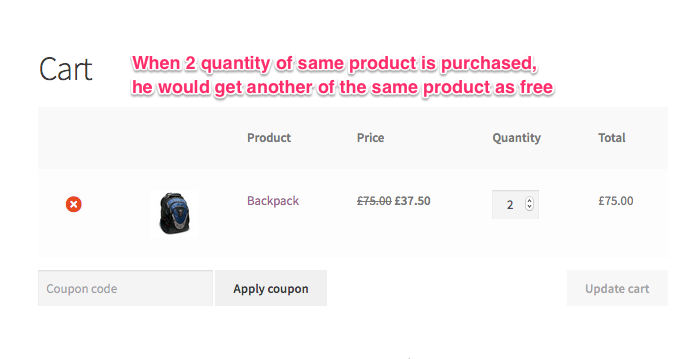 Another example: When customer purchases just 2 quantities of the Backpack, he is now eligible to get 1 of the backpack free. Because he is just purchasing backpack. As you can see above, he is charged only for 1 quantity of Backpack, while he gets another 1 quantity free. 1. 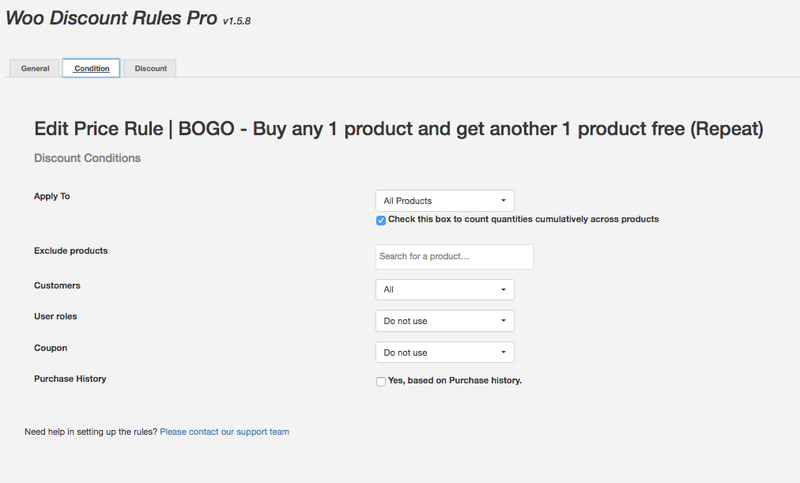 How to configure "Buy 2 and get the third product free" ? In other words, this actually means: "Buy 3 products and get 1 among the cheapest as free" So you just have to start the Minimum quantity range with 3. Now, the customer would get a cheapest product free when there are 3 items in the cart. This is valid up to 5 quantities. 2. What if i wanted to provide free products only from selected categories ? 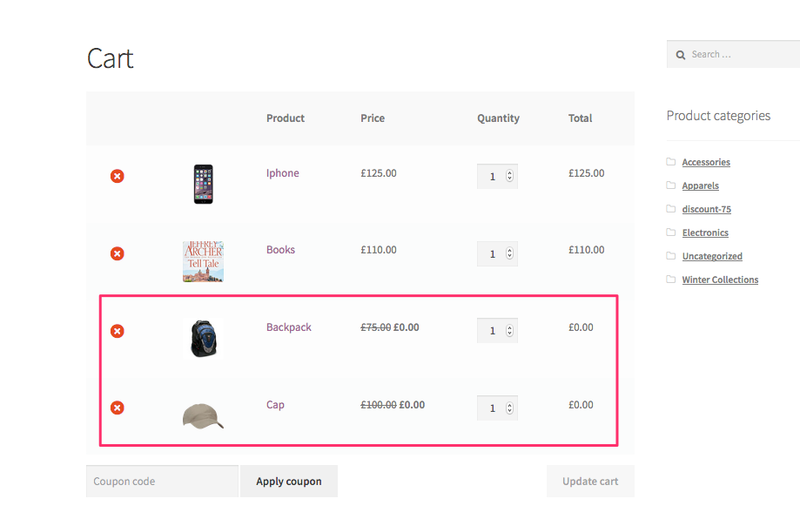 Then choose the categories from which you wanted the discounted products be given. The customer would get a 50% discount on the second product he purchases. You can add more ranges like 4 to 5, 6 to 7, 8 to 9 and adjust the item count for repeating this discount for purchasing more quantities. Sure. You can do that as well. Just add only one range with the maximum quantity set to 99. Now customer will get only 1 cheapest item from the cart as free no matter how many items he purchases. 5. I want to provide just one or two specific product as free. Sometimes, you want to specify just one free product with all the purchases. Customer will now get 1 quantity of CAP as free for any purchases he makes. You can also add more free product or increase the free quantity if required. Contact us via the Live Chat button below with your discount requirements. Let us guide you.